I’m going to be frank with you! I don’t like food bloggers! There I said it!! I don’t like them at all!! They always come up with the most delectable treats and I have to make them!! It’s not fair! Do you want to see what I had for dinner last night? Then you will understand why I don’t like food bloggers!! See, I ate pretzel bread for dinner! Fat, gooey, cheesy, stuffed with jalapeno pretzel bread!!! Your probably wondering who I am mad at! It’s Sally from Sally’s Baking Addiction! About a month ago she posted a 30 minute pretzel recipe, and I thought 30 minutes, I have to try that! The rest is history! They were so good! The following week, my Husband asked when are you making pretzels again? After I had a big dinner, I was so full, but I made pretzels again and ate them! The first time making Sally’s pretzels, I made them with all-purpose flour! They were light and fluffy, so perfect!! Then the second time I made them, I used bread flour. That was not by choice. The grossest thing happened. I reached into a fairly new bag of flour and saw some black spots in the flour. I was wondering what they were, then a spider came out of the flour! AHHHHHHHHHHHHHHH!!!!!!!! A tossed that bag of flour into the garbage, grabbed the garbage bag and ran, tripping over myself, to the outside garbage can. That was not fun!! So by default I used bread flour instead of all purpose. Oh man, they turned out good!! A little to good if you ask me! 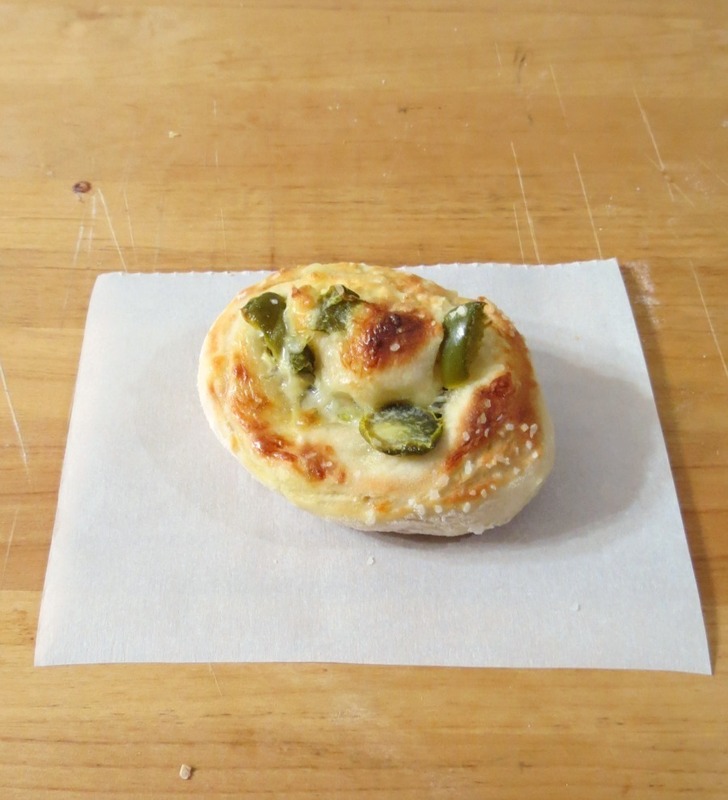 Then on my way to work yesterday morning, at 5am, I was thinking of jalapeno cheese pretzels, but in an actual loaf. Who thinks of that stuff at 5am? I guess a food blogger does? I couldn’t stop thinking of it all day!! So that night for dinner, I made these beautiful little pretzel breads! Ok, I wasn’t fair to Sally at Sally’s Baking Addiction! I just love her blog! I discovered her blog a couple of months ago and I have simply loved all of her recipes. She makes the most wonderful treats! I swear I want to make everything!! But what’s even better than her recipes, is her appreciation of her readers. She posted a couple of weeks ago, photos of her food that her readers made and sent to her. I thought it was so sweet!! You really should check out Sally’s blog!! Tell her I sent you and I said “hi! !” Ok, let’s get talking about pretzel bread! First check out the center of the first piece I ate! This bread takes like 10 minutes to make, really it does! The first thing I did was add yeast and water to a bowl, added some sugar and salt, give a mix and in the flour it goes. The recipe calls for 4 cups of flour, however I ended up using 3. I wonder if bread flour is a thicker flour and I didn’t need as much? But any way, mix the flour with the yeast mixture until it pulls away from the side. Knead the dough about 5 or 6 times, until smooth. Then place dough onto a floured surface. 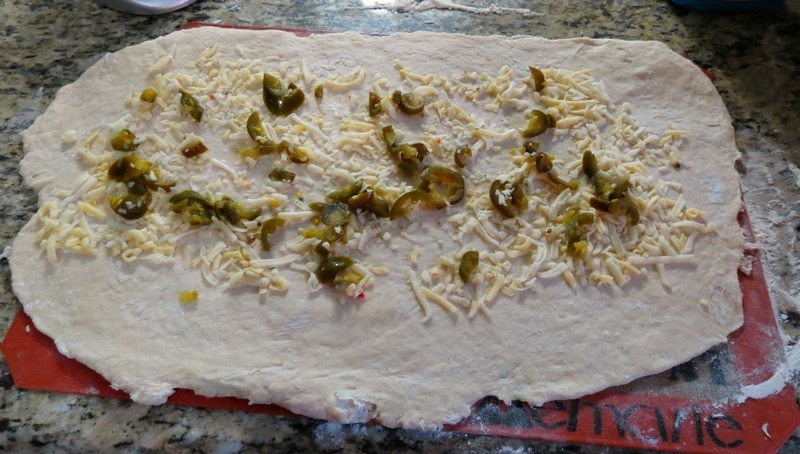 With a rolling-pin, roll the dough out to a rectangle shape, and sprinkle with cheese and peppers. Roll the dough up like you were making pinwheels or cinnamon rolls and seal the seams together. Sorry for the pictures. I had dough on my hands, and I made a mess all over my camera. I cut the dough with my dough cutter, but a sharp knife should work. Then place the dough seam side up onto a baking sheet, brush with egg and sprinkle with salt. Bake in the oven for 5 minutes, then turn the broiler on and bake for 5 more minutes! That’s it!! It’s really easy and the dough is wonderful to work with! You could so serve these with nacho cheese, cream cheese, marinara sauce, but personally I like them just as they are! These would be so perfect for the Super Bowl or do like I did and have them for dinner! They are so good!! I am soooooo loving these!!! I ate 4 for dinner! Not a healthy dinner, but a dam good one!! 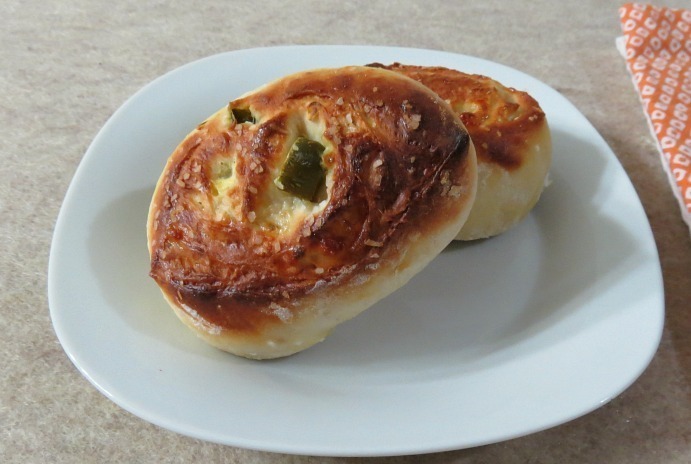 A fluffy, gooey, cheesy pretzel bread filled with jalapenos and pepper jack cheese. Line a baking sheet with parchment paper or Silpat; set a aside. In a large bowl add yeast and water; stir with wooden spoon. After 1 minutes, add salt and sugar; mix until combined. Add bread flour one cup at a time, mixing in between each cup. Add enough flour to where the dough pulls a way from the sides of the bowl. Knead dough about 5 -10 times until soft and there is no more flour remaining in the bowl. Sprinkle flour onto working surface. Add the dough to surface and with a rolling pin, roll out dough into a rectangular shape, about 15 x 9". 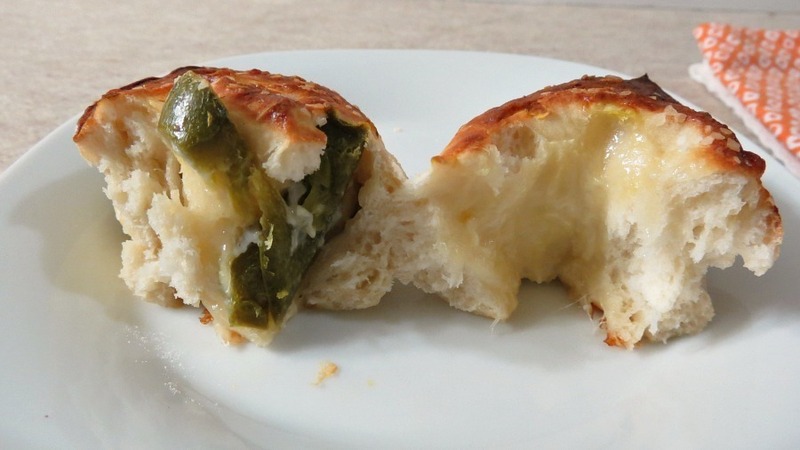 Add cheese and jalapeno to the center of the dough. Starting at 1 long side, roll dough into log, pinching gently to keep it rolled up. With seam side down, cut dough crosswise with thin sharp knife or dough cutter into 18 equal slices (each about ½ to ¾ inch wide). Place the dough, cut side up onto prepare baking sheet. Place the egg in a bowl and scramble with a fork, brush each piece of dough with the egg and sprinkle with salt. Bake in oven for 5 minutes; then turn the broiler on and bake for 5 more minutes until lightly golden. I wish these pretzels were not sitting on my counter right now. I need to go to bed and I know I’ll be dreaming of pretzels! Oh, by the way, these pretzels freeze nicely! My Husband likes to take them to work and they defrost by his mid morning snack time! I microwave them for about 20 seconds, then pop them in the oven for a few minutes. Or you can place in a ziplock bag on your counter for a couple of days. But honestly they are best fresh out of the oven! I can not wait for them to cool, those jalapenos and melted cheese just calls me!! I want to thank Sally for posting such a great recipe!! It’s so much fun and so easy, not to mention quick!!! Wow, these look SO GOOD. Sally, I’m mad at you too! I think I might have to make this. Lol! Darn that Sally and her tasty recipes!! She posted more yummy recipes this week that I want to try!!! These are, like, speaking to me. Make me now. Make me now. lol! I know I’m thinking of them right now!!!!!!! Wow, They look so good!!! Thanks Penny! I have to admit is is soooooooo good!!!!! ohhh boy — these look deadly. haha who doesn’t love jalapeno cheesy anything?? Thanks for sharing this great recipe. I am such a jalapeno and cheese person! Add bread and I am in heaven! I swear I could of eaten the whole thing! The beginning of this post cracked me up! I just love how food bloggers are able to come up with the recipes that are so very creative! Hey Jennifer! These look SO SO good! It looks like the link to my pretzels doesn’t work. I was wondering why I never got a ping back for these! I must make them this way ASAP 🙂 You’re a genius! Hi Sally! The links work, I just tried them. U had over 50 views yesterday. Can u check them again? By the way thank u for the pretzle recipe. We love your pretzels. I have totry your whole wheat with cinnamon and sugar. 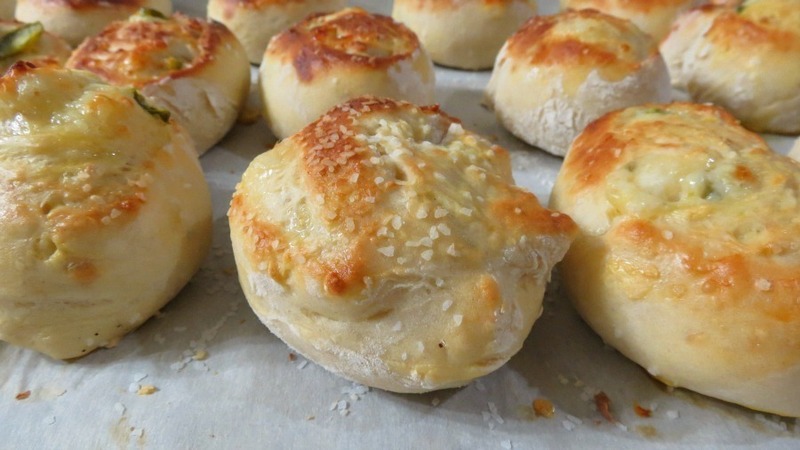 Love that you adapted Sally’s recipe and made rolls, rather than pretzels. And they look so browned and cheesy and good and doesnt even look like you used very much cheese. Impressive! I just made 1 hr pizza dough today, adapted from my 1 hr pretzels and I bet I could do something like this with that dough. You got me thinking! I didn’t want to use to much cheese because I was afraid it would ooze out everywhere!! Love your pizza dough recipe!! Thank you for having me! If you make them, let me know what you think! I wanted to let you know that I featured this today in my “What I Bookmarked This Week” post – stop by and see! Thanks Danielle! I love this recipe! It’s one of my Husbands and my favorites! I’m so much looking forward to this that I’ve been mentally rewriting tomorrow’s dinner plans since I stumbled upon it. What was going to be blue cheese and bacon burgers has morphed into a roast chicken with these gorgeous rolls as a side. Obligatory veggie and salad along side to lessen the glutenous guilt of eating a pound of pretzels goodness. On a side note – I only have all purpose flour – would four cups be about right? Thanks for posting this. Thanks a lot. Ha ha, your school was awesome to serve cream cheese jalapeno stuffed pretzels. We didn’t have good stuff like that. I hope you enjoy this recipe. When I first made the recipe it was such a hit for my Husband and I that I made it just about every Saturday night. We couldn’t get enough of it! I would say 4 cups of regular flour will work. Just remember, you may not need all of the flour, I used 3 cups. All of your food ideas sound great, now I am hungry and hankering for a blue cheese bacon burger. Yummy! Let me know how it turns out for you. Enjoy!